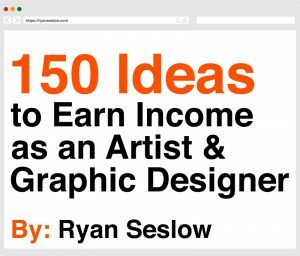 150 Income Generating Ideas That Artists Can Use. The Experiment. 150 Income Generating Ideas That Artists Can Use, The Experiment! 9/2/14 – The pre-launch post! It is now day #29 of my 30-day experiment to create a positive new habit. Much more than this has happened and I am really excited about it. Notice that I have included my fellow human beings into this process. As an art professor I get asked a lot questions from my students, colleagues and friends along these lines, “How can I earn money with my art skills? What if I am not going to be an art teacher, can I still find work as an artist?” Or “Where do I start on creating a freelance business with my design skills?” A few days after the 30th day of my commitment to this goal I will release the whole exercise technique/process that you can apply and the 150 income generating ideas as a downloadable e-book. It is my intention to release the book via here on my website, amazon.com and on ibooks. I will keep you posted on this! If it has been a secret to you that I’m a personal development buff then welcome to this part of me. I love to help people. I especially like helping people over come default thinking and dispelling false beliefs about themselves. I’m not a stranger to this by any means; in the past one of the things that I was shy about sharing here was interconnecting my passions for spirituality and personal development with my art teaching philosophies and freelance practices. I am happy to say that I overcame that self-imposed roadblock about two years ago. Since then, I have experienced a lot of new growth in areas I could not have foreseen back then. Public speaking, writing, learning code, HTML and CSS are just a few of those things, there will be more on this topic soon. Conscious awareness of our habitual daily behaviors can be a tricky thing to tackle when we do not know what we are looking for. One way to take on this exercise is to make a list of the things in your life that you would like to be, do or have. Once you have that list in front of you, tally up how many of those things you already have or are experiencing? Is the majority of that list something that seems far out of reach, is it something that you are constantly waiting for? Are you waiting to be discovered as an artist or designer? Perhaps you are always waiting to be hired by some organization or company? Are you waiting until you have the right amount of funds to have, do or be that thing that you desire? Are you always waiting for more waiting? Valid questions, but it is easier to not take responsibility for contributing to what is not there. Are you putting the blame on someone, something, or some circumstance? Either way, we can condition ourselves to continue to get what we do not have. Self-awareness begins with taking responsibility for your life. And I do mean all of it. This certainly means the way that you think and what you spend most of your time thinking about. This means everything from how you see the world to your career and finances to all of your relationships. From your education to your living arrangements. From the mechanics of your inner life and spirituality to your personal hygiene. It is also how you treat yourself and how you react to and treat others. When you have taken full responsibility for your life you are not a victim in anyway shape or form. You do not blame anyone or anything for what has not worked out for you, or for the things that you do not see in your reality. Our brains are malleable and programmable. Electric and responsive! We participate in the programming our brains. This occurs both consciously and unconsciously and our repetitive commands fueled by emotions (positive and negative) become automated skills that the brain simulates for us via the subconscious mind. Are you aware of your thoughts and what you are feeding yourself day in and day out? We average about 50,000 – 70,000 thoughts per day, and most of those are repetitive. Awareness means a lot! If you are unconsciously perpetuating 40,000 thoughts per day on what you do not want and what is not there, are you aware of what your focus is? You are experiencing exactly more of what is not there and what you do not want. There have been tons of studies on thought pattern behavior in the areas of habitual thinking and practice. We have the power to make changes, and it all begins with a choice. It is known that in as few as 30 days positive new habits can be formed and negative habits can also be changed. What are the main ingredients? It is your conscious awareness and open participation to want to make a change. Changing outdated beliefs and negative thought habits would free up a lot of space for new awareness, new interests, new experiences and desires. But what about creating a new habit to activate the awareness of something seemingly new that has really been under your nose for a long time? Can we learn how to see and create new opportunities that have always been close by? Indeed I believe we can. This exercise has proven this to me. Today, on day 29 I have now generated 145 income-generating ideas that I can start to apply into my freelance business. I will begin testing the ideas and sharing my experiences via this blog. I know that YOU can also use many of these ideas, while inspiring you to set your own goals or intentions to install over 30 days. This technique can literally be applied to anything. I will share more on this in the book. It is important to know that we are always capable of solving many our perceived problems and issues with a little discipline and a little planning. It helps when these motivations are fueled with positive emotions and excitement, as well as considering how we can help our fellow human beings at the same time. By making commitments to our self-discovery and personal development we will become more. I believe that this awareness helps the whole world. The world gets better when we get better. I am extremely excited to share this process with you all, stay tuned.